Are you Looking for Health and Happiness? Do you struggle with busyness or overwhelm? Are you juggling home and work commitments? Maybe you’re feeling drained, unfulfilled and never feel nurtured? Many clients come to me feeling anxious, exhausted and overwhelmed. Life has lost its joy. Often they’re not sleeping well. They may be struggling with anxiety, depression, hormone imbalance or even an autoimmune disease. They’ve tried massage, chiropractic treatments, osteopathy and maybe even acupuncture. They might not feel bad enough to see a doctor or a psychologist but they’re not happy and something needs to change. Or they may have tried lots of mainstream medical treatments and they’re still not well. Lots of my clients are women who have willingly (or not so willingly) given most of their time and energy to care for their family or build their career. They may have young children, difficult teenagers, elderly parents or grandchildren that need their time and attention. They may have an unfulfilling marriage, or lack family support. Most of my clients are at the “WHAT ABOUT ME?” stage of life. They’re starting to resent always putting others first but feel guilty taking time out for themselves. As a business owner, wife, mother and grandmother I understand how challenging it can be to juggle all the commitments in life and take care of your own health and well-being. I also know how important it is to make sure that your lifestyle is sustainable. Not just in the short term but for the long haul. A really good question to ask is… “Is the way I’m living my life improving my health and well-being, maintaining it or depleting it?” I’m curious what your answer would be? One form of traditional, natural medicine talks about the “accumulation phase” of a disease. This phase may occur over 10, 20 or 30 years or more before an actual disease is diagnosed. At that point most people wish they’d made changes to their lifestyle 10, 20 or 30 years ago. Rate your physical health and well-being? Rate your emotional health and well-being? How meaningful are your day to day activities? What your scores would be?? 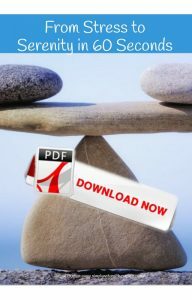 So… if there’s room for improvement, then I strongly encourage you to Download my Free PDF– Stress to Serenity in 60 Seconds to receive a sign up for my Tips and Techniques for Health and Happiness. These simple, natural strategies are design to help you reclaim your well-being and get your answers to those 4 questions as close as possible to 10 out of 10! I’m Alison Burton. As an Occupational Therapist I have a strong background in mainstream medicine. I’ve worked in mental health, drug and alcohol rehab, family and group therapy. In 1996 I trained in Clinical Hypnotherapy and Psychotherapy. Since then I’ve become one of Melbourne’s leading Hypnotherapists and currently specialise in stress, anxiety, pain management and mindbody healing. I’ve had lots of experience using hypnotherapy to treat Irritable Bowel Syndrome and other tummy troubles with remarkable results. I’m the Director of Simply Natural Therapies, a natural health clinic in East Doncaster . I’m also is a sought after public speaker and I’ve appeared on ABC National Radio, SBS Radio, Foxtel’s “Living Life Now” and “The Healer’s Way”. I’ve also featured in The Age, Herald Sun, Insight Magazine and local news media. I love spreading the word about simple, safe and natural ways to support the health of the mind, body and soul. I have a really keen interest in all aspects of natural health and well-being, energy medicine, human consciousness and bringing common sense back to health care. My interest in energy healing is often incorporated in my work through the use of Reiki, Kinergetics and acupressure techniques including Emotional Freedom Technique (EFT). My aim is to help you to reclaim your health and happiness. Struggling with a physical, mental or emotional issue. Suffer from stress, anxiety or depression. Looking for natural therapies or natural remedies to help with a health issue. Ready to take control of your health but need some support. Have tried medical or pharmaceutical options but are still not feeling yourself. Have a health issue or chronic pain that doctors and specialists can’t pinpoint. If you too believe that you deserve to feel and look well then why not begin your journey to reclaim your health and happiness now? We’re here to support you.